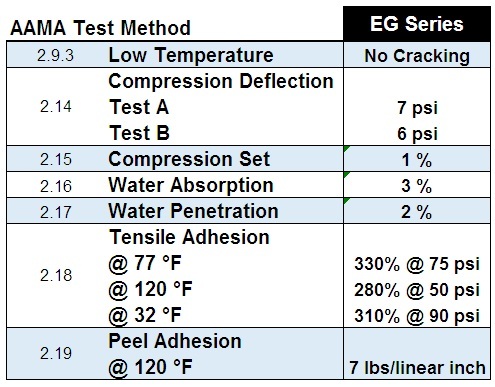 EG620 Series – Gaska Tape Inc.
Gaska Tape’s EG Series of products are high performance closed-cell, cross linked polyolefin foam tapes. They are coated on both sides with a highly aggressive acrylic pressure sensitive adhesive, that adheres well to a wide variety of surfaces. These products are available with a blue polyolefin film liner or an 84# polycoated two side, brown kraft liner. All products have been tested according to AAMA 800-05, section 1.6, 810.1-05 Expanded Cellular Glazing Tape, Type 1, and exceed the specification requirements. All products are available in white or black. Products perform well over a broad temperature range and are excellent in all type of glazing applications.